The war-of-words between Sun Microsystems and NetApp over patent infringement claims wages on, while legal means to settle the matter have failed. The two companies tried to sit down this week for a settlement conference, but judging by Sun's response of publicly boasting that it has removed at least one of NetApp's patents from the litigation and declaring the legal scuffle a war between ideologies — we'd say the mediation wasn't entirely a success. In a blog post by Sun executive veep and legal chief, Mike Dillon, he describes the meeting as "rather brief" and notes the parties "weren't able to resolve the dispute." He goes on to say the patent office has granted the first five of its requests to reexamine the validity of NetApp's patents. The court has agreed to pause until the office is done with a second dig through the patents, and Dillon claims "at least one" NetApp patent infringement claim is already off the table. Dillon continues with a spirited open source rally cry that's extremely familiar to Sun's approach to its current legal tussle with NetApp. Neither company seems to want to talk about the lawsuit outside of their corporate blogs. But at least they're willing to fight dirty on their own digital territory. 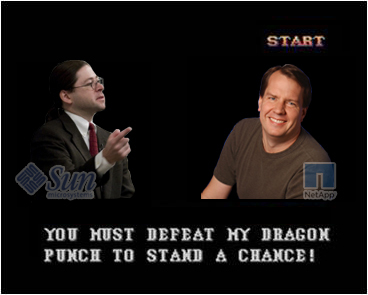 The fight began in September 2007, when NetApp filed a lawsuit over alleged patent violations in Sun's ZFS file system. The lawsuit claimed not only is the ZFS technology lifted from several of NetApp's WAFL (Write Anywhere File Layout) patents but Sun is also giving the work away for free, open source. Sun responded with a denial and a lawsuit of its own. In October 2007, it countersued with the claim NetApp was violating seven of its own patents, and in turn, most of NetApp's major products infringe its intellectual property. A week later, Sun sued again in a Northern California court, closer to the headquarters of both Silicon Valley companies. Then this April, Sun sued a third time with a new batch of patents it alleged had been violated. The latest round involved NetApp's storage management software it acquired with the purchase of Onaro.. Apparently Sun comes out swinging if provoked. Sun claims to have won this round of litigation. According to Dillon, Sun contends NetApp has infringed a total of 22 patents used in products including NetApp's FAS6000, FAS9000, FAS3000, FAS2000, V3000, SnapMirror, SnapVault, SynchMirror, R2000 Platform, NearStore Virtual Tape Library, and others. The companies have provided some entertainment beyond the IP claims with plenty of waspish words and propaganda directed at one another via the corporate blogs of NetApp co-founder Dave Hitz and Sun CEO Jonathan Schwartz. Sun champions itself as an open source hero, fighting for the developer community. "It has become increasingly clear, that although NetApp originally claimed this case to be about Sun's alleged patent infringement (an assertion which we are confident we will prove was unfounded), the case is about something else entirely. It's really about the clash between two different business models, one proprietary, the other open." NetApp meanwhile, thinks its property was stolen and that its reputation is being smeared by Sun using the open source banner as an excuse. Sun said it expects to hear more from the patent office about the validity of NetApp's patents over the course of the year.